you’re as good as they come...♥️s and ⭐️s on everything you shoot (and THEN some!) 🙏🏼 ...and thank you for the tips!!! I’m In Vietnam right now. Nice shot. 1 more week for this photo shoot. 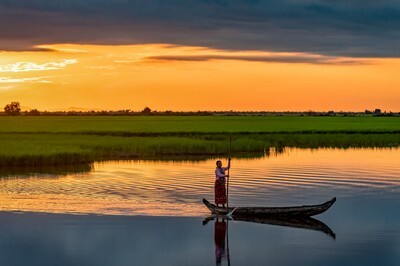 A woman returns home from harvesting rice in her field, as the first rays of sunlight begin to colour the dawn sky. Her husband is catching fish with a throw net nearby, while her children gather sticks and prepare a cooking fire to make breakfast with.